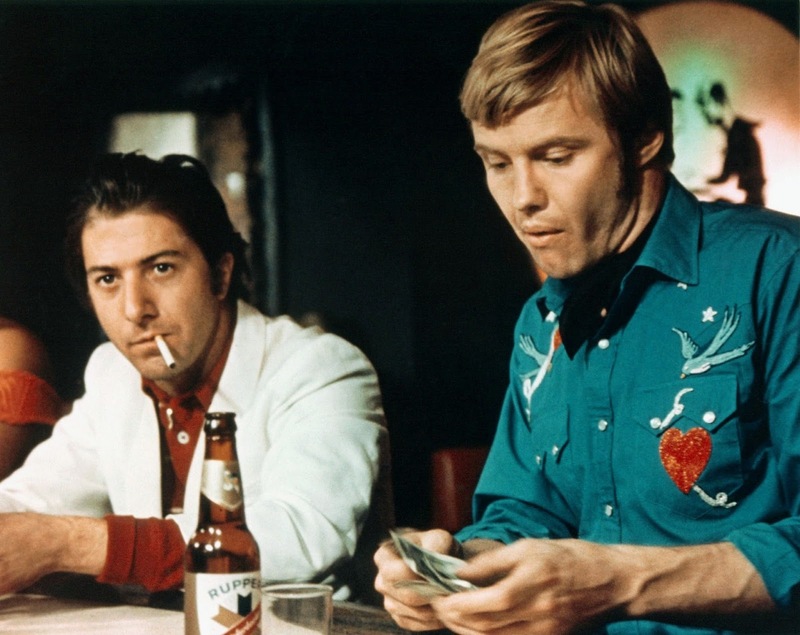 A quintessential 1970s character drama, Midnight Cowboy is the story of two down-and-almost-out characters who forge an unlikely friendship. Handsome, sturdy and dim dishwasher Joe Buck (Jon Voight) leaves his life in rural Texas behind and heads to New York City. In flashback, snippets of Joe's troubled childhood are revealed, including a disturbing relationship with his grandmother and a passionate affair with a girlfriend that ends badly. Now Joe's intention is to sell his services as a male prostitute with a cowboy persona to the wealthy women of New York. But his early and clumsy attempts to make a career as a stud are a miserable failure, including an early session with socialite Cass (Sylvia Miles) that ends with him paying her. Joe stumbles across Rico Rizzo (Dustin Hoffman), known to all as Ratso, a suitable nickname but one that he hates. Ratso is a penniless gutter rat and petty thief with a bum leg and a persistent cough. He promptly swindles Joe out of $20 by sending his to see a religious zealot on the pretext of arranging to find him a manager. Eventually, with Joe quickly running out of money and getting ever more desperate, Ratso takes him into his derelict apartment in a condemned building. The two men establish a spiky friendship as they attempt to find ways to make enough money to eat, stay warm and take care of Ratso's worsening health. Directed by John Schlesinger and written by Waldo Salt adapting the James Leo Herlihy novel, Midnight Cowboy is a slice of societal anthropology set in corners often ignored. The story of the pathetic gigolo and the pitiful tramp finds the human spirit fighting for survival and small moments of joy against the forces of poverty, rejection, hunger, cold and despair. The film is absorbing in its depiction of the struggle for survival and dignity, the pace surprisingly brisk and the misadventures of Joe and Ratso always offering ever newer levels of desperation. Midnight Cowboy is paradoxically filled with elegance, beauty and the essence of companionship. Schlesinger constructs an affecting, deeply involving narrative filled with poignant moments, made all the more enduring by the certainty that Buck and Ratso do not have the capacity to actually succeed at anything. Their life and hopes will forever be a series of disappointments, and they will nevertheless not give up. Even from the bottom of the sewer, hope persists that tomorrow will be a better day. The affecting soundtrack by John Barry perfectly complements the film, and includes Fred Neil's song Everybody's Talkin' and the soulful, legendary main harmonica theme by Toots Thielemans. The cinematography by Adam Holender captures life from the perspective of two men at the bottom looking up, the tonier districts of New York City offering a cold, unwelcoming shoulder while the seedier districts tantalize with nighttime lights, blurry neon colours and the promise of cash earned the dirty way. In a career-making role, Jon Voight embodies Joe Buck and creates an enduring image of a strong but slow man buffeted by life yet determined to make something of himself using his limited skill set. In his first role after The Graduate, Dustin Hoffman announces his outstanding range and reinvents himself from clean-cut college kid to street scoundrel persevering on society's left-overs. Rico Rizzo persists only in the dumps and condemned margins of the city, yet when he roars I'm walkin' here! at an errant taxi, he owns the street, ever so briefly. Midnight Cowboy starts with a long bus ride and ends with another. In a testament to both the human spirit and the film's unique viewpoint, both are journeys incredibly propelled by unbridled optimism.